THE title accurately describes the contents. 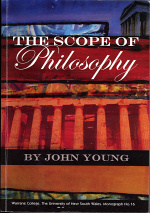 John Young is well equipped to produce a study of philosophy that covers a wide range of thinking about this elusive subject. The first four chapters outline the development of philosophical thought from the ancient Greeks through to the modern schools of post-modernism and pragmatism. We are not short of such historical studies but, for a concise, accurate and readable potpourri of this subject, this one is hard to beat. Just for the historical survey alone this volume deserves a place in Catholic high school reference libraries. Having established this necessary chronological foundation, the author devotes an excellent chapter to comparing his topic to other academic areas such as maths, science and theology. In these days when Catholic schools are sometimes suspected, not without substantial evidence, of not being good at integrating their advertised, Christianity with secular, scholastic disciplines, this is matter with which every departmental head should be familiar. At this stage of the book, Mr Young has identified himself as a Thomist so this comparison is based on, what are generally considered to be sound philosophical principles. Three chapters then combine to analyse various theories and types of knowledge. Under the headings of Knowledge in General, Sense Knowledge and Intellectual Knowledge, this controversial aspect of the human story is presented in a manner that makes these abstractions understandable. Although there is no agreed definition of this activity, this treatment is a cogent argument in favour of Aquinas’ concept based to a large degree on plain, old, common sense. The author then remerges as a historian as he returns to modernity to provide a deeper study of post-modernism and several other contemporary systems. The concluding section is thematic as ontology, with its fascinating act – potency dichotomy, is investigated along with the nature and existence of God, beauty and art and ethics. With Study of Religion now well established in the Queensland curriculum, this work has an obvious place in libraries as a reference or even in the students’ desks as a text. Without the peril of over-simplification, a writer who understands a significant but difficult subject area has provided a guide that is understandable and authentic.